The Simple and Economical way to deal with lightly Oil Contaminated bund and drain water. -- Removes oil, fuel and sediment from contaminated water to an almost non-detectable level. -- Reduces operating costs by elimination the need to remove contaminated water by tanker as special waste. 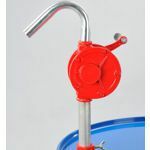 -- Reduces the risk of prosecution by reducing the temptation to release contaminated water into the environment. -- Highly useful to companies registered for BS EN ISO 14001 certification. -- Only tool needed is a screwdriver. 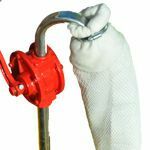 -- Simply connect the Filter-Sock to a hand pump and secure with the supplied hose clip. -- Pump the contents of the bund or drain through the Filter-Sock. -- Regular check the discharge for cleanliness. -- Dispose of the used Filter Sock as oil contaminated waste. The Filter-Sock is not suitable for high pressure pumps or for emulsified liquids. The user should ensure that the Fitler-Sock is monitored to ensure only clean water is discharged and that all local and national regulations regarding discharge to the ground, waterways or other catchments are complied with.